I was out of town all last week, and even though the Christian conference I went to had a TON OF GREAT VEGAN FOOD INCLUDING DESSERT (the world is changing, people, the world.is.changing)…I am missing my normal food routine. 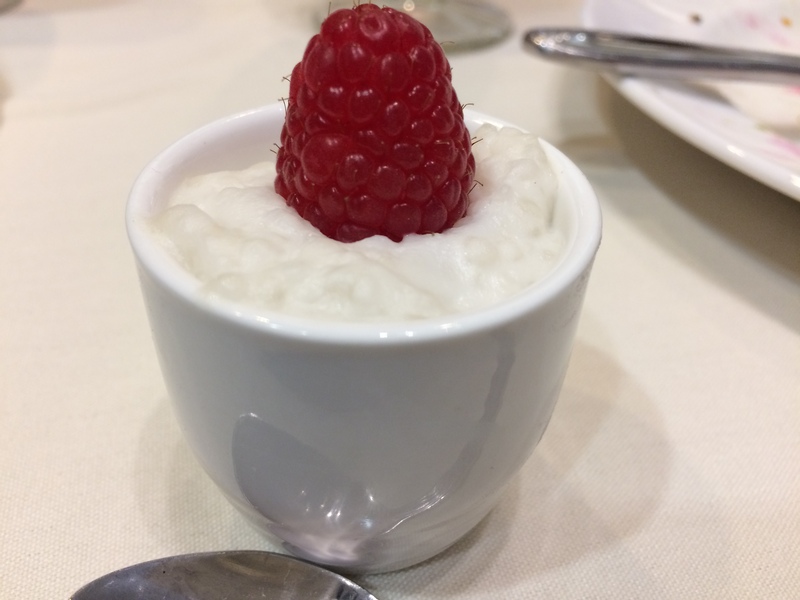 Look at this tiny vegan tapioca pudding! I held my pinky up the whole time I was eating it. With baseball season out of the way and just one evening appointment this week, I’m going to practice a little care for myself by making sure to choose dishes that are nutritionally balanced and full of good stuff that I can’t always get when travelling. Sunday: I took my green curry paste out of the freezer, so we’re going to have that One-Pot Lentil Dal with Vegan Naan. Tuesday: eat out … lately, I’ve been really digging the Disco Chick’n from Hip City Veg. And a few weeks ago when we were there, they had a vegan strawberry shake that was to die for. Strawberries are fruit. Wednesday: If we can find the right kind of jackfruit (I’ll keep you posted if you remind me), we’ll try BBQ Jackfruit Sandwiches with a side of raw carrots. Thursday: Vegan Mac and Cheese – a recipe I haven’t tried before! We’ll have a big salad for some green, too, obviously. When this posts, we will have just gotten back from Ecuador. The fridge will be bare, I won’t have slept on the plane, and we’ll need to go grocery shopping and feed ourselves and unpack and catch up on new episodes of Sherlock. Monday: Jumbo Chickpea Pancakes. I’ll make ours perhaps with teensy tiny mushrooms and a little Trader Joe’s beefless crumbles to go along with the avocado and hummus. Tuesday: we have an appointment at the dinner hour in South Philly, so we’ll probably go sample the vegan offerings at this fun little spot. You’d never know this little hole-in-the-wall would have a HUGE range of vegan goodies, from Caesar salads to dessert! Wednesday: That Easy Vegan Seeded Whole Grain Bread was so damn delicious, I’m going to make it again and use it as a base for Vegan BLTs. Saturday: post-baseball game homemade pizzas – we’ll use Daiya mozzarella or Miyoko’s if we’re feeling splurgy, plus Lightlife veggie bacon & pineapple or Lightlife pepperoni & black olives. Old school, with a vegan twist. Every Saturday evening, I sit down with my calendar for the upcoming week, a stack of my favorite cookbooks, my laptop, and a pen and paper. Twenty minutes later, I have a menu for the week and a grocery list. I’ve heard from a number of friends and family that one of the biggest hindrances to eating vegan is not knowing what to cook. I’ve also heard from friends who are in a food rut. So, I might not do it every week, but when I can, I’ll post our weekly menu here. I’ll miss the mark sometimes, but most will be kid- and budget-friendly, fast, and filling vegan meals. I work full-time, and I often work from home. If a recipe needs a little extra time in the stove or oven, I pause in the late afternoon and then get back to work while the food does its thing in the oven or on the stove.